But bike numbers have a hold on me, specifically distances. I track my rides, jotting numbers in little yellow notebooks. Over the years I've mostly lost interest in extremes of speed but distance riding is what still intrigues me and adding up the numbers is an annual tradition. 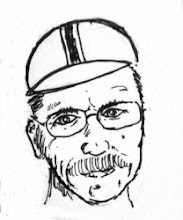 I belong to a club called C-KAP which is composed of other kilometer accumulating cyclists. C-KAP is a Canadian organization but they are broad-minded enough to let those of us who reside in less metrically-inclined countries participate as well. And so I track and report in kilometers but I am an American and I also do the conversions and watch the numbers roll by in miles as well. And last year when I totalled the numbers it was just a bit lower than I'd like. 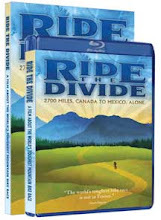 The total of 19,174 kilometers would seem to be a respectable enough number, but converted to miles it's 11,914 miles. Looking at that number it struck me that 12,000 miles would make me happier. A thousand miles per month for the year. That'd be a little nicer. Or so I thought a year ago. But day to day I don't think that much about the numbers. I ride because I love to ride. I jot the numbers down because I always jot the numbers down. And December winds down and I'm adding up the numbers and it's just a little low. Coming into this final weekend I still needed 126 kilometers. No problem. Except for my hacking cough. I spent Saturday whining. I'm really bad at being sick and my wife and kids will tell you that I do not suffer in silence. I hacked up glop, I whined, I moaned. I did creep out on the bike a bit Saturday afternoon for a very easy 11 kilometers of riding. My pal Mark Vande Kamp and I had plotted a Sunday ride. I was feeling a bit better by Saturday night and paused my hacking and whining long enough to commit to a ride to the Black Diamond Bakery with Mark. Saturday night I dosed myself with the white man's cure for SARs -- chicken soup, Sprite and NiQuil. And today we ride. My cough is pretty much gone but I still managed to shoot about 1/2 a gallon of snot out my nose over the course of the ride. The ride wasn't just about distance, of course. It's about chatting with a pal and riding fine roads on a fine day. And it's about great baked-goods and coffee and plans for adventures in the new year. Mark doesn't have quite enough time in his schedule to cover the full distance I need for the day but the run to the bakery and back gets the bulk of the kilometers taken care of. Back in Issaquah, Mark picks up his car and heads for home. I tack on a loop around Lake Sammamish and roll back home with 128.43 kilometers on the computer. 19,323 kilometers for the year equals 12,009 miles. A totally stupid number. A number that means pretty much nothing except that I spend a lot of time on my bike. A dumb number that makes me happy. 2007 will have more roads, more kilometers, more numbers jotted in little yellow notebooks. I've got a few adventures planned and a few more stories to tell. I hope all of you out in the blogosphere have a 2007 that is filled with all the best kinds of adventures. We got an inch of snow last night, not a big traffic-snarling storm, but enough to make things white and make me feel smart for having snow-studs on my bike. I don't ride very far or fast, just up to Redmond and back. It's warmer and greener by the river. A heron stands patiently, eyeing the water, waiting for lunch to swim by. Colin Fletcher writes of secret worlds , the places just a tiny bit off the tracks trod by most men. 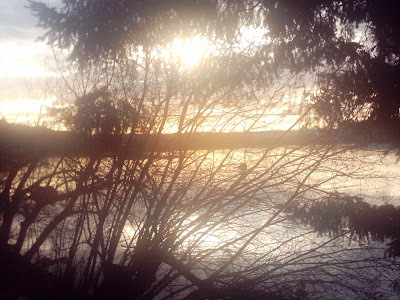 These are the places that restore the soul and if you are lucky or wise, you find that these place are never far away. While there is great adventure to be found in thousand mile summers and breath-taking beauty in the far distant mountains, the small places are within hiking or biking distance. It is only a few hours on a Christmas afternoon. Christine and the boys and I share many adventures but we also know that loving someone doesn't mean that every moment is a family moment. Some paths are trod alone, some secrets must be found in silence so they can become stories for a later telling. 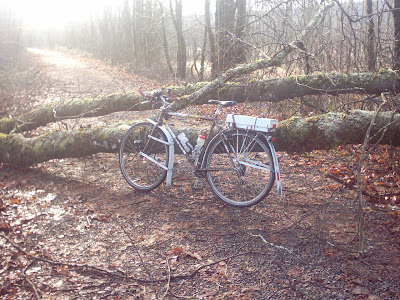 I grab my bike and roll into a dry winter day. My plan is vague and my tires rugged. The gate is just off the known road. This is an unnamed bit of county land. I feel, rather than know, that this is some old farm, a bit of creekside deeded to the county. There are no buildings here, but bits of old gates and fence posts hint of a time when there were more men than a lone cyclist on a Christmas day. The water and the trees have their time and tiny tracks tell me that something passed here whose life is more fleeting than mine. I wander, I wonder, I ponder and I poke around. I grow cold if I'm too still and wheels are ultimately made for rolling. Eventually, of course, strange paths rejoin known roads. I could give a report with more detail, a GPS track to guide others to this gate and that rock. But exact coordinates give scant guidance to the secret worlds. These lands are better mapped by poets than cartographers. I don't know what lies out your back door, but I know that I find something new each time I roll out mine with rugged tires and vague intentions. My wife, sons and I live with less stuff than a lot of Americans but Christine and I often reflect that we still have way too much stuff. The boys, so far, don't share these concerns and are currently spending a good bit of effort pointing out how much better our lives would be if we added a Nintendo Wii to our existing collection of stuff. So far, the Peterson household is Wii-free but I'm quite sure that state will not last. The boy's both have jobs and the Wii is far niftier than anything as mundane as cash. "in the endless cosmic game of rock-paper-scissors... desire is greater than need." I have no solution to this and we all do what we can in life. 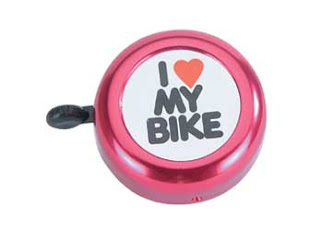 I know that I am happier now that I work for a non-profit and mostly what I sell to people is the idea that a bicycle can be a valid and fun way to get around. It's a good fit for me, better than when I worked at a bike shop. Don't get me wrong, I loved working at the shop, but when I told Mark I was leaving to go work at the Bicycle Alliance he said, only half-joking, "It's the $7,000 Serotta's that pushed you over the edge, right?" It wasn't really that. The Serotta's are lovely bikes and if someone wants to spend that on a bike and loves it, that's great. But my nickname at the shop was "You Don't Need That." Various times folks would come into the shop saying "I need a new bike." I'd get to talking with them, trying to find out what the have for a bike now and seeing what they like and don't like about it. And sometimes in talking with them I'd find that they really like their existing bike, but they'd get a stiff neck if they'd ride for more than an hour. And we'd chat some more and look at them on the bike and they'd walk out the door with a $30 stem instead of a new bike. Or if they would get a new bike I'd just instinctively turn folks towards a cheap, rugged and versatile Surly Cross-Check or Bianchi Volpe instead of one of the gleaming jewels from Colnago or Serotta. 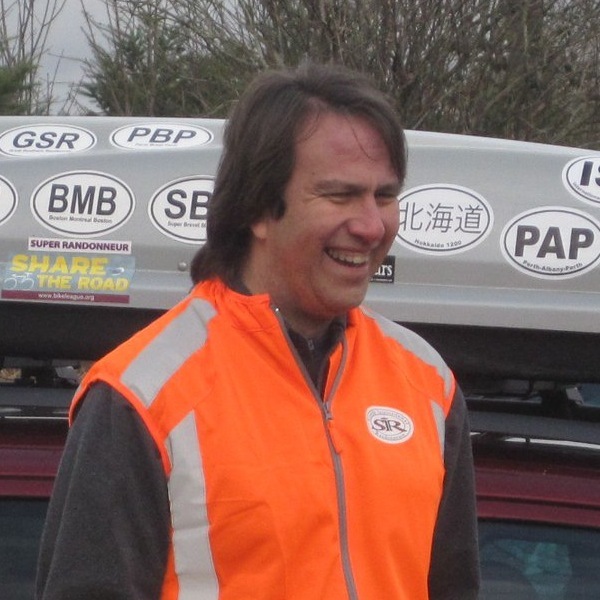 Mark Thomas isn't just the owner of Sammamish Valley Cycle, he's also the president of RUSA, a friend of mine and he's also on the board of Directors of the Bicycle Alliance of Washington, the place where I now work. So I still see Mark all the time. A few weeks ago he stopped by the Alliance and I asked how things were going at the shop this year. "Great," he replied, "sales are up 20% since you left!" One of the many things I like about bicycles is they are about balance. You keep moving to keep your balance. OK, some of you are really good at track stands, but in general bikes are about balanced motion. If you go bike touring you quickly learn that too many luxuries aren't really all that luxurious. Hauling all the comforts of home with you is a certain way to be uncomfortable. On the road, you will find your balance. And so we roll on. We weigh our options. We balance our needs and desires and play the endless game of rock, scissors, paper. Some times at the end of the day, we hear a little voice that says "you don't need that" and other times we hear a voice that says "life would be better with X." On this blog I often talk about this or that cool thing I've found. And I'll still do that. But mostly, I'm still trying to balance. I do have too much stuff. I'll be spending part of this holiday season packing some stuff up to give away. After all, I have to make room for new stuff! Pat Franz at TerraCycle is a really clever guy. His company makes nifty things for recumbents and other bicycles. Pat recently sent me a TerraCycles Multi-purpose Accessory Mount and I'm really impressed with both the design and construction of this little device. shows a bunch of different configurations. Recumbent riders often have to be creative when figuring out ways to mount lights, cycle computers and other accessories, but randonneurs and a variety of gadget junkies face similar problems. The accessory mount is very solid because the twin arms let you form a nicely triangulated structure. I've found that having a second light mounted low lets my light cast a nice beam for illuminating upcoming potholes and other nasty things. The accessory mount costs $29 and it's made in Portland Oregon by cool folks who care about bicycles. While reflectors do increase the visibility of night riding cyclists, reflectors alone are not enough. Lights are key to making the bicyclist a visible and safe user of the roads and paths. 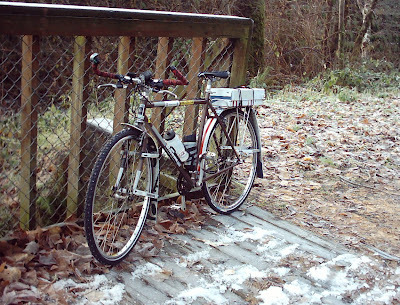 Washington law states that "For night bicycle riding, a white front light (not a reflector) visible for 500 feet and a red rear reflector are required. A red rear light may be used in addition to the required reflector (RCW 46.61.780)". Unfortunately, many cyclists ride without lights after dark. Get Lit Washington is a program designed to directly address the problem of unlit cyclists and raise awareness of the need for cyclists to use lights at night. Get Lit Washington is directly inspired by the original Get Lit program in Portland, Oregon. Created by Jeff Bernards, Get Lit simply and directly addresses the problem of cyclists riding at night without lights by providing front and rear LED lights to unlit bicycle riders. By directly giving lights to riders, Get Lit Washington will have an immediate positive effect on the night cycling safety of those riders. Additionally, Get Lit will raise awareness of bicycles as vehicles and draw attention to the legal requirement that cyclists have lights. The bulk of the funds for this program will go directly into the wholesale purchase of lights. 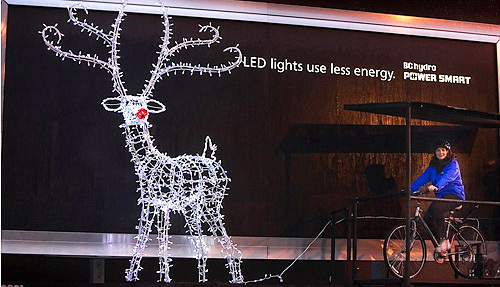 The distribution of lights will follow the model successfully pioneered in Portland, Oregon. Volunteers will specifically target low income bike riders who are currently riding at night without any form of lighting on their bicycles. Lights will be installed directly on the bikes and the bicycle riders will be instructed on how to use the lights, including instruction on how to remove the lights to prevent theft. A self-addressed stamped survey card will be given to each bicycle rider receiving lights under the Get Lit program. These cards will be used to gather various data needed to track and evaluate the success of the program. Volunteers will work directly at dusk or dawn along various bike transit corridors to find bicycle riders in need of lights. Additionally, the Bicycle Alliance of Washington will work with various shelters and low income programs to identify low income cyclists in need of lights. It is important that the Get Lit program does not in any way undermine or seem to undermine the various bicycle shops in the community or the commercial concerns of the lighting vendor. To address this issue, the program specifically targets low-income bicycle riders, those people unlikely to purchase a bicycle light or even be aware of that lights are commercially available. Press coverage of the program will serve to promote understanding of the problem of unlit night riding bicyclists and should serve as a catalyst to spur increased use of lights in general, including those sold via the various local retailers. Planet Bike has agreed to provide head and tail lights in bulk quantities at very favorable prices. While most of the lights will be distributed by volunteers there will be some printing and postage costs to create survey cards to measure and evaluate the success of the program. There will also be some small administrative costs in compiling the data and transporting the lights, but most of the funds will go directly toward the purchase of lights. 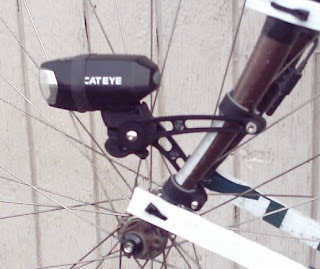 For $2500, the Bicycle Alliance of Washington will be able to equip 200 low-income cyclists with front and rear lights. The Bicycle Alliance of Washington will work with communities and local volunteers to make the program available in various locations across Washington state. If significant funding comes from a single regional source (ie. a county or town), the program can be targeted to that specific community. The main limit on the program will be funds and the availability of local volunteers. The program may scale up as needed, but because of the pricing structure of the light supplier, lights must be purchased in lots of 100 sets. The sweetest words I heard today came from a robot. "No one is available to take your call. Please leave a message after the beep." I was calling Christine to let her know that I'd be a little late getting off from work and then I'd be swinging by REI to pick up some candle lanterns and do some Christmas shopping. She'd said she'd call me if and when our power came back, but she'd probably ventured off to somewhere with warmth and light. But she didn't need to tell me. The robot told me. Our phone machine has power. We have power. But I'm still picking up some candle lanterns on my way home. It's a bit before 4:00 AM on Sunday December 16th. I get out of my semi-warm bed, where Christine and I have been sleeping, "wrapped up up like ornaments waiting for another season" to use Dar Williams' phrase. 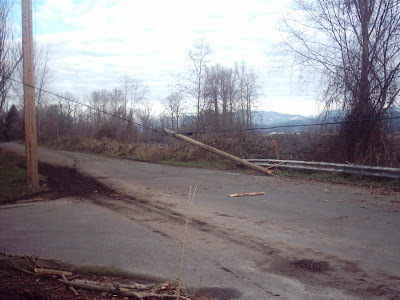 A huge windstorm passed through the Pacific Northwest on Thursday night, making my commute home rather interesting and knocking out power to hundreds of thousands of households including the Peterson's. Friday was kind of fun. All the downed trees and closed roads made it easy for me to skip work and no power means no computer and no computer means Christine's job at Safeway.com wasn't happening either. We made coffee and soup on the backpacking stove, read books by candle and LED light and listened to the news on the battery-powered radio. "It's like camping," I told Christine. "If we were camping, we could build a big fire to stay warm!" she retorted. The cold is a problem. Night time temps are below freezing and as time goes on our normally electrically-heated place gets progressively colder. Saturday was a day for hunkering down. It's not clear how long the power will be out here, so we gathered in supplies from what stores are open and running on back-up power systems and generators. Christine knows that the lights are on in much of Seattle and she's planning on taking the bus in there to Christmas shop and have "good food and a warm beverage somewhere where I don't see my breath." I'm also planning on getting out, following through on a plan I'd made earlier in the week. I'm riding up to Snohomish to have breakfast and ride in the countryside with my friend Mark Vande Kamp. The 4:00 AM start is considered "normal" for me. What isn't normal, I reflect, is actually taking off clothes in preparation for going outside. At home, I'm bundled in many layers including my Montbell Thermawrap jacket, but the Montbell is a little too warm for riding. I keep my base-layer of wool intact but trade the Montbell for my Marmot windshirt. I add some reflective gear, turn on all my bike lights and head out into the darkness. It's really dark, and mostly quiet. I work my way north through dark intersections. Here and there I hear the growling of portable generators. Microsoft's Lake Sammamish Campus seems to have emergency power and I smell woodsmoke coming from the chimneys of the big, dark homes along the lakeshore. Up in Redmond there are pockets of power and darkness. As I climb up 208th Avenue I work my way around downed tree limbs and power lines. At the crest of Novelty Hill the recently sprouted sprawls of Redmond Ridge and Trilogy gleam as if celebrating their powerful good fortune, but just past these glowing islands Novelty Hill plunges steep and icy to the dark Snoqualmie Valley. I work my way north up the eastern edge of the valley, my studded tires rumbling reassurance on as the frosted pavement gleams beneath the beams of head and helmet lights. 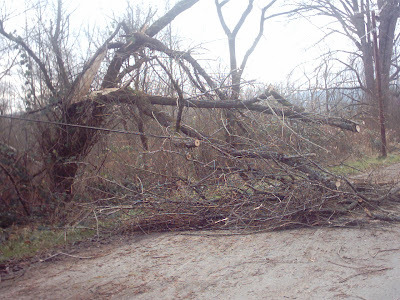 There are lots of fallen limbs along the road and dire signs of destruction. A sliver of a red-orange moon hangs low in the eastern sky and the stars twinkle in the smoky air. I know that "Road Closed" signs do not always mean a road is impassable and I've ignored a few of these signs in my time. But some times, times like now, those signs are true. The sign in front of me is backed with barricades and the barricades have police tape extending to the very edges of the roadside forest. Of course, I have to make certain, so lift the tape and slip my bike under. By the light of my helmet light, I creep forward. "Gee, the road seems dark ahead," I think and then I realize there is no road there. 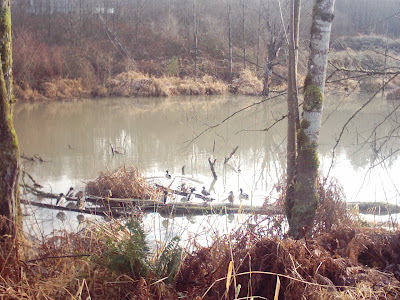 What had been a tiny tributary, a capillary creek is now it's own river, charging headlong to join the Snoqualmie. What had been the road is now empty space, a chasm I could only cross if I had E.T. himself packed in with my bike supplies. 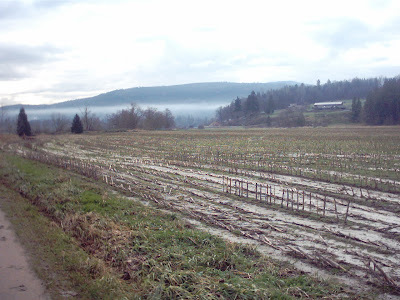 I retrace my tracks, riding south to the Woodinville-Duvall Road where I cross to the east side of the valley before resuming my northward trek. Duvall wrapped tightly in darkness but as I roll north on SR-203 I start to see lights. It's 7:00 AM as I roll into Monroe. The mountains to the east are beginning to show hints of sunrise and the town is lit with Christmas lights and neon open signs in the cafes and coffee shops. I now roll east again on the old road to Snohomish. I roll up to the Twin Eagles Cafe a few minutes past our scheduled 7:30 AM meeting time but Mark is understanding when I tell him about my reroute. We feast on big, fat-laden breakfasts and catch up on details of each other's lives. We opt to ride a loop north and east. Mark has to be back in Seattle by mid-afternoon and both of us are here mostly to make sure the other gets out and gets some miles on the bike. Snohomish is pretty much equally inconvenient for each of us, which is why it is the ideal meeting place. We ride and chat and solve many of the problems of the world. Between the two of us, we have an impressive array of opinions and trivia but sometimes we find things that stump us. Today's mystery is the white stuff on the branches. We pause to investigate. 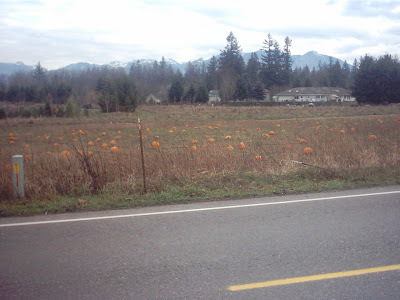 and abandoned pumpkins in the field. I'm home by 2:00 PM. I've got 168 kilometers on the bike computer and there still is no power in Issaquah. But the crews are out there working and more and more homes are coming back on line. Soon it will be our turn. My friend Tarik is fond of describing items and events as being craptacular. As near as I can figure, Tarik uses craptacular in two related but slightly different ways. In the first sense, craptacular refers to something that really didn't live up to the advance expectations. In this sense you would say something like "our trip to Moab turned out to be a craptacular fiasco." But the second sense of craptacular, the one that I find more interesting, is when you have something that you assume will be total crap but it in fact turns out to be better than you expected. In this case you would say something like "the fake latte from the coffee robot in the Quickie Mart is actually quite a craptacular beverage." Yesterday I was in a store called Fred Meyer, which is one of those big everything stores like Wal-Mart or Target and I saw that they had all their bike accessories on sale for 20% off. 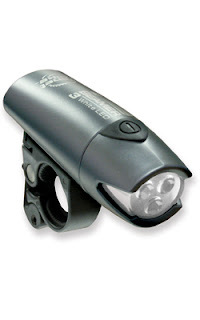 Now there are various companies out there making good bike lights, companies like Planet Bike and Cateye, and I use and recommend those lights. But when I saw that I could get a Bell Night Trail headlight and taillight set for $12.79, I had to give them a try. I also splurged on a pair of flashing ankle bands at $6.99 each. I'd actually gone to the store looking for battery-powered Christmas lights, which I didn't find at Fred Meyer but I did later find at Lowes. 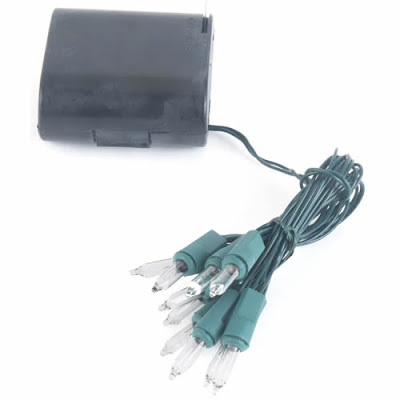 A string of 10 white Christmas lights costs 99 cents at Lowes, but of course the 2 C batteries needed to power the lights cost a lot more. I bought 4 sets of lights and the batteries to power them. I also got some AAA cells to power the taillight. I did spend a fair bit of time contemplating just how screwy it is that this stuff can be made in China, shipped half way around the world, sold for so little and this is completely thought of as normal business. It is screwy, screwy as in somebody is getting screwed. And, of course, I'm part of the problem. But I'm also trying to help poor people here. My office at the Bike Station is half a block from the Union Gospel Mission in Seattle and some of the homeless folks there have bikes that we help keep going. And they don't just ride in the daytime. So part of me can say I'm checking out cheap alternatives for poor folks and part of me is just mucking with lights because I like to muck with lights and part of me is writing about this just so I'll get some comments about better sustainable solutions. But enough of this geo-political angst, let's talk about the cheap lights. I used all this stuff on my dark and rainy commute this morning. The Bell headlight worked surprisingly well. I'd loaded it up with freshly charged NiMH AA cells and for part of the commute I used the Krypton bulb in the light and for the better lit sections I switched the light to use the lower power LEDs. This really cheap light actually has a high and low krypton beam and a solid or flashing setting that uses two white LEDs. If your batteries are too low to power the Krypton bulb, you can use the LEDs which draw much less power. The plastic of the light is pretty flimsy and I could see myself accidentally breaking the case while changing the batteries. I could also easily see water seeping into the electronics and mucking everything up but the light did survive this morning's commute. As for weather-proofing, I think I'll employ a trick I've used with other lights, dripping candle wax or silicone sealant over the sensitive electronics. I'll probably supplement the fragile case with some duct tape. 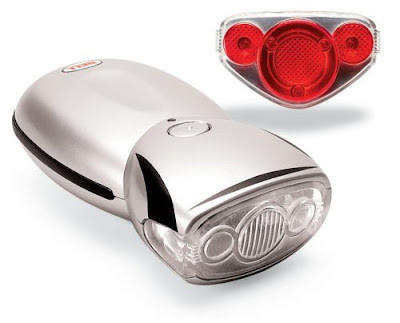 The taillight is very bright and can be set to solid or a variety of flashing and chase modes. It's actually a really nice little light. Both the head and taillights come with fairly decent mounting brackets for placing them on your bike, but I tend to supplement every bracket with an additional band cut from an old inner tube. In the case of the taillight, instead of mounting it to my bike, I kept my existing Planet Bike light on my bike and zip-tied the Bell taillight to the back of my helmet. The Bell taillight is definitely brighter than the several year old Cateye taillight it replaced. In general, the current crop of LED lights are brighter than the best lights from a few years ago, so it's worth checking out some of the new stuff. Planet Bike has a 1/2 Watt taillight that is amazingly bright. But for a cheapo light, I'm really impressed with the little Bell. The LED ankle bands also seem pretty darn nice. I have no idea how long the coin cells will last in these things, but ankle band that both reflect and light up are a good idea. I rode into work with the ankle bands flashing. I wrapped the 40 Christmas lights around my frame and secured them with red and green zip-ties. I tucked the 4 battery packs into my bike's coroplast trunk. If I was really going to do this right I'd wire them all up to a single pack of NiMH batteries and maybe add a flasher circuit and I may do this at a later date. For now I'll see how long the 8 C cells last. I'm really not too worried about going fast in the winter and the Christmas lights really do give my bike a craptacularly festive look. You'll have to take my word for this, I tried taking a picture of my bike in the dark, but my cheapo camera is too craptacular to really capture the spectacle! I've never claimed to be much of a photographer, but I do live in a very pretty part of the world. And I've gotten into the habbit of carrying a very cheap Aiptek PenCam SD with me on pretty much every bike ride. The picture above is the view looking east at Mercer Island with the Cascade Mountains in the background and the stream of cars coming over the floating bridge. The picture below is the view of Mount Rainier of to the south. I took both these shots at about 7:30 AM on Friday December 8th, 2006. I often tell people that my commute is a part of my life that I really love. Some mornings I see the morning light as it just touches the Olympic Mountains. Sometimes in the dark I'll see deer or a coyote or a raccoon heading home. I've seen eagles soar on the air currents above Mercer Island drifting over multi-million dollar homes built by software and airplanes and expensive coffee. I see ribbons of light painted by thousands of my fellow commuters. Every day I roll by people looking at the world through windows and I'm happy that I'm on my bike. I never know what I'm going to find out on a bike ride. 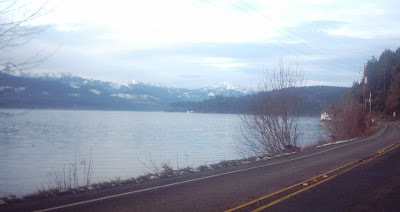 Today I got up at an insanely early hour, rode to the ferry terminal in Seattle, met up with a bunch of other Seattle Randonneurs and rode the South Hood Canal 200K,. 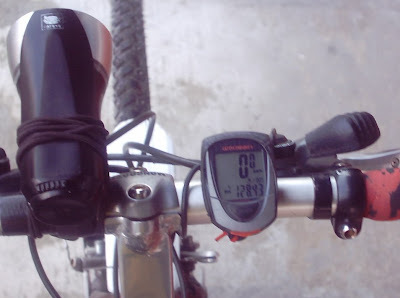 Actually this ride is more like a 215 kilometers long and by the time I was back home I had 278 kilometers for the day. All day long the temperature was in the range that you'd find inside your refrigerator (or freezer) but it was beautiful along the canal, with great views of the mountains. But the absolute coolest thing was this owl. I was rolling along and zipped right by him and about half a second later my brain went "hey, was that an owl?" After making sure that there wasn't any traffic about to clonk me, I pulled a u-turn and and came back by the owl. 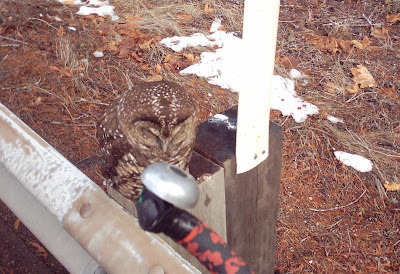 The owl was sleeping peacefully on one of the posts supporting the guardrail. I could see it breathing and it stirred a bit when the camera beeped as I took this picture. Until today, I've never been this close to an owl in the wild. That silver thing in the foreground is the bell on my bike's right bar-end. I left the sleeping owl and continued on my ride. It's often easy, too easy, to look out the window, see the world as hostile and decide to stay inside. It's warm inside, the coffee is on and you really should catch up on whatever it is you're sure needs catching up on. I do this often and often times it is the perfect thing to do. But then there are days, days like today, when the temperature is just below freezing and the fog is still hiding the mountains. It's early, but I am like a kid on Christmas morning. For, you see, I have these tires now, big rugged studded tires that flew here from Peter White's shop in the frozen northern lands of New Hampshire. Last night the UPS man dropped them off. "You're not going to do anything stupid with those tires now, are you?" Christine's question cuts to the heart of the matter. "No, of course not!" I lie. The truth is that yes, I do stupid things like ride my bicycle on ice. The studded tires certainly won't prevent me from doing this but the theory is that they will let me do this stupid thing in a less stupid manner. This morning is the test. I'd worried that as soon as I had the tires in my possession things would warm to the point all the ice would be gone but the cold, crystalline air and pale patches of frost reveal a perfect morning. The studs rumble on the pavement and crunch on frozen leaves. I approach the first ice patches with caution but studded tires at 50 PSI grab both bare road and slick ice with equal aplomb. 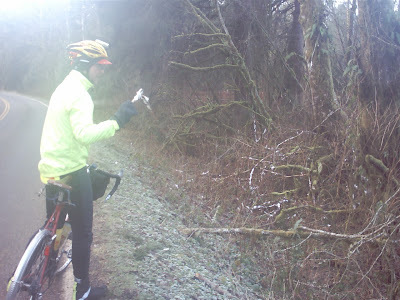 I ride up to High Point on the trail and then ride the frosty road to Preston. I fill my mug with coffee in Preston and roll on to Fall City. Passing the Dead End sign that is a lie, I roll up to the Snoqualmie Trail and ride up to the fog-shrouded Falls. 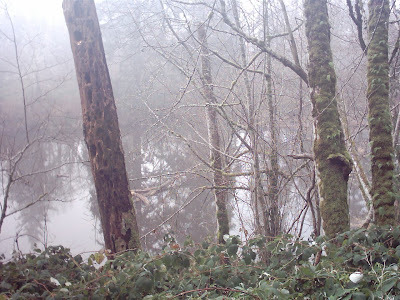 I descend and turn onto Fish Hatchery Road, past another lying sign alleging that the road is impassable. Two wheels have fewer limits than four and two studded wheels are tools for nearly infinite exploration. But today is not really an exploration, it's a celebration. This winter will not be endured, it will be embraced. I'm home by noon, with 52 kilometers on the computer and a silly grin on my face. Some folks worry about the rolling resistance of big studded tires, but I'm happy with the way these tires resist. They resist the urge to stay inside, to say "I'll wait until a nicer day."